I believe that sometimes modern items need to come out at SCA events. I don’t have any problem with items like PDAs or smartphones, but I would prefer that they look the part of something from period. With that in mind, I decided to make a cover for a friend’s iphone that would imitate a wax tablet. I feel like I cheated in several main areas to make it more functional. I used a commercially available wood iphone case made by a company called Vers. I also attached everything together using velcro, so the tablet could be taken apart and the iphone used by itself in the wood case. For this project I decided to use zebrawood, which I had on hand and liked how it looked with the cherry iphone case. I tan suede to hold the two leaves together and keep the tablet shut. 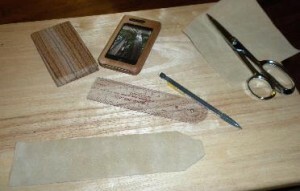 The piece of zebrawood and the iphone case had the soft pieces of velcro so the tablet could be taken apart. All of the hook velcro pieces were attached to the suede and then had 4 small holes punched in them. I used adhesive backed velcro, but used x-stitches on the hook pieces as well. 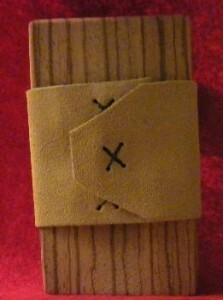 X-stitching through the hook velcro. The final tablet looked nice, but I’m not sure it was as functional as I would have hoped. I think it may too bulky and hard to handle easily. I will update when my friend has had more time to play with it and can give me some feedback. Overall, I was pleased with how it came out, and although I think I would make changes if I did it again, I’m not sure what those changes would be. The project only took a few hours, and was pretty easy.